Authentic, fresh, and first of its kind michelada mix. Crafted in Chicago for michelada lovers everywhere. Just add our mix to your favorite beer and enjoy! Michelada translates to my chelada, (my cold one). There are endless recipes and different takes on what a michelada is. Classically, it's a beer cocktail prepared with lime juice, salt, and spicy red elements. En otras palabras, es una cerveza preparada bien chingona y picosita pa'la cruda. Don't do the cerveza thing? 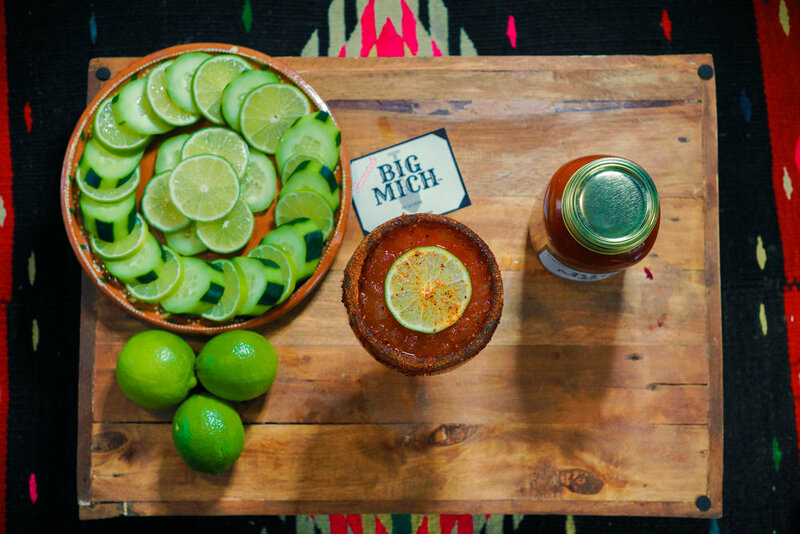 Try out our Big Mich mix with your favorite mineral water or bubbly limeade of choice for an authentic flavored Miche-nada! We use the freshest and best ingredients possible for all of our michelada products! On May 4th, 2017, my fathers birthday, I fulfilled a lifelong dream of starting a family-owned business. I brought my 10+ years of industry experience and my passion for micheladas together to create an authentic, fresh, and unique, all in one mix. We are thrilled to share our michelada recipe with the world. Nothing has ever made more proud, I present to you Big Mich, a michelada company. Connect with us! Use #BigMichChicago or @BigMichChicago !